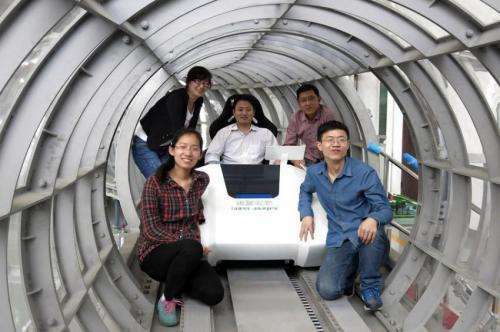 A Chinese researcher's concept of a super-maglev reaching higher speeds was put to the test recently according to a detailed report appearing earlier this week in the Daily Mail. "China's first manned megathermal superconducting maglev loop has been tested successfully by the Applied Superconductivity Laboratory of Southwest Jiaotong University." The researcher, Dr Deng Zigang, who is project lead, is focused on developments for a high speed train system of the future. He is an associate professor of the Applied Superconductivity Laboratory. His superspeed train concept involves an enclosed vacuum tube vehicle. Gas 2 said air is the limiting factor on making even faster high-speed trains, but vacuum tubes operate in a vacuum, removing the air and letting even a low-power vessel operate at enormously high speeds. Maglevs make for very fast and smooth journeys but speeds are limited due to the excessive air resistance encountered at these speeds. The vacuum tube designs could allow trains to travel over seven times faster in the future, said the Daily Mail. Are we looking at the future of train travel? Lidija Grozdanic in Thursday's Inhabitat also commented on the significance of his work: With regular maglevs, more than 83 percent of traction energy is wasted through air resistance at speeds higher than 250mph. Zigang has a tube that lowers air pressure in the running environment to 10 times less than normal. She also noted that the higher speeds that could be achieved would be a big deal, as currently the fastest passenger-carrying train, the Shanghai Maglev Train, in contrast, reaches a high speed of 268 mph. Zigang said trains could reach speeds of up to 1,800 mph (2,897 km/h). The technology could be applied in military and space-launch systems. In the Daily Mail report, Zigang posed with the track where the super-maglev vehicle runs. 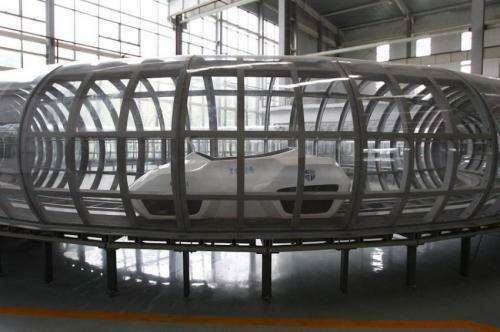 The circle, said the report, is China's first manned megathermal superconducting maglev loop line, and is 12 meters in diameter. Zigang has been developing the technology for a number of years; Japan's researchers also look forward to making further progress in high-speed train systems. 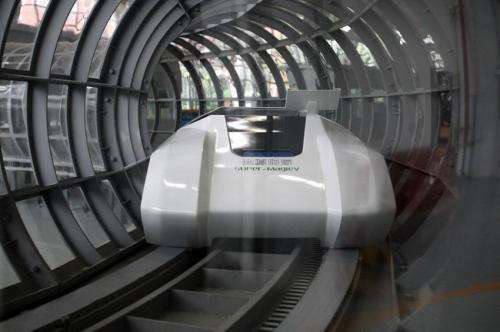 In 2012, Japan made considerable maglev news when it was announced that Japan was looking way beyond its bullet train system toward a next-generation, no-wheels maglev (magnetic levitation) system. New trains scheduled to go into use in 2027 are to link Shinagawa Station, in central Tokyo, with Nagoya and will travel at about 311 mph. The extended plan is to have the new trains connect Tokyo to Osaka by 2045. "Chinese researcher's concept"? Hardly their concept. Robert Goddard came up with it in the 1910's. He made prototypes too. And where is the 12 meter diameter tube? Is that a typo? That tube looks closer to 2 meters. Saying it is capable of...and the actual speed in testing, are two different things. "And where is the 12 meter diameter tube? Is that a typo? That tube looks closer to 2 meters." I read that as the diameter of the track, rather than the tube. Acceleration and deceleration should make for an exciting ride at those speeds. 12m is the diameter of the track. I don't believe it is feasible. It will cost a lot to build it, besides to keep "vacuum"-near state inside, and its safety could be compromised at any time: what would do a bullet piercing the tube ? Could this ever be affordable technology in western world...here in the UK, just to build a high speed rail similar to France costs so much money. Even the maglev with the air is still too expensive to implement in the west, no idea how japan make a profit over it. One tenth atmosphere is not much of a vacuum. I wonder what is the limiting factor on the reported (excruciatingly precise) 2897 km/h top speed? Is turbulence a factor? The top speed seems to be a direct conversion from 1800 miles per hour - not so precise. Eat your heart out Elon Musk. The Daily Mail is a UK Tabloid. Previous headlines have included "Just ONE cannabis joint can bring on schizophrenia as well as damaging memory." Believe nothing you read here and move along folks. The problem in Europe is: stuff is much closer together. You don't have large stretches over which such speeds can be achieved (i.e. when you're not in the acceleration/decelartion phase). If such spaces aren't available then it doesn't make much sense to go for extreme high speed trains. Maglev, linear motor, magnetic induction whatever you want to call it, is a well established technology in use in many countries around the world. It is the environmentally friendly, energy efficient transportation system of the future. Based on Coulomb's law, the same basic principle as a particle accelerator or the US Navy's magnetic rail gun. What stands out in the article is the reference to military or space launch applications. Theoretically it could be used to gradually accelerate a vehicle with passengers to 99% of light speed. We would need a rail gun about 600 million kilometers long. What would happen if it struck something or how to decelerate is still a mystery. Any volunteers? Right idea but lacking intuition and imagination. The tube itself should become the induction and the vehicle similar to a Faraday cage. Would take very little energy over area and would levitate within the tube. Tube wrapped similar to a speaker tube, with balanced capacitors to each coil and connecting to the next, total control of the capsule..for the air, a partially evacuated tube and a turbine in the car to draw and eject on a venturi effect..
Maglev, linear motor, magnetic induction whatever you want to call it, is a well established technology in use in many countries around the world. Apart from test tracks there are some (very few) systems at low speeds. At high speeds there is only one (Shanghai Maglev). As for environmentally friendly: yes (maglevs are 30% more power efficient than regular trains and more than 50% better than planes). However there is one aspect where they aren't: they are very loud. The german transrapid had 90dBA at 25 meters distance (which is about the noise level inside an industrial factory). This is another reason why a fully enclosed - and low pressure - system makes sense. It would be much quieter. I think that having 0.1 atmospheres inside the tube makes it realistic. It is by no means high vacuum, so you could use ordinary rotary pumps and the demands on leakage would be very moderate. To make the influx of air when inserting the train as low as possible, you could use an oversized load-lock. BUT, I really do not see the need for a superconducting mechanism. It will only make it more complicated, more prone to failure and does not bring anything "new" to the table. For me, the best solution would be to combine the conventional technology of maglev (the german technology) with evacuated tubes as described above. Also, trying to simplify and reduce costs of the maglev would be a very good idea.